Time is of the moment. Time is of the essence. Time is money. What is time? What do you know about time? You may know time by the rising sunrise, or the setting sunset. You may know time by your clock, watch or computer. You may know time by changing seasonal skies, temperature, precipitation, vegetation. You may know time by the passage of holidays! You may know time by meals you eat. You may know time by special events. Time, in a general sense, is a measure of passage- seconds, minutes, hours, days, seasons, years, millennia. Horology is the study of time. Horologe means “clock” and horary means “hourly”. Take your time. Don’t lose it! Time to get up, time to do this, time to do that! How do you tell time? Do you look at the sky to see its position in the sky to know the time of day? Do you look at a clock? Do you wear a watch? You can count time out loud. Seconds are measured by saying “one thousand one” in a normal speaking speed. Sixty seconds make a minute. Sixty minutes make an hour. Twenty-four hours make a day. Seven days make a week. Four weeks (average) make a month. Twelve months make a year. Ten years is a decade. Ten decades is a century or one hundred years. Analog time, or time that is measured by movement of gears, usually tells us minutes and hours. On occasion such a watch or clock may tell the month of the year. Make a time poster that gives examples of what you can do in a second, a minute, an hour, a day, a week, a month, a year, etc. What time is it? How many times have you asked this question? Think about it. Somewhere in the world it is morning right now. Somewhere the sun is setting. Somewhere someone is looking at stars. Someone is going to bed. Someone is getting up. Take a look at the world in the last thirty minutes. You can see where it is night and where it is day. Most of the time you can tell the time of day by looking up at the sun. To do this you should know where the sun rises and where it sets. In between, usually at noon, it is overhead. How do you know what time it is in other places? The world is now divided into 24 time zones. The zones start with a longitudinal line that runs from the North Pole to the South Pole and that passes through Greenwich, England. 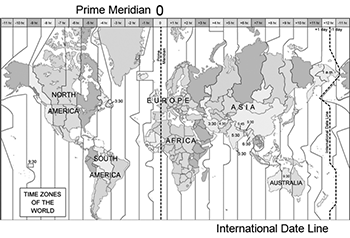 Visit the Prime Meridian at Greenwich to learn how time landed in England. Make a flattened time map showing the 24-hour time zones starting at Greenwich. Our measurement of time evolved over time. From the beginning the rising and setting of the sun set up a repeated cycle that became known as 1 day. Which civilization recorded time and how did they measure it? It is now thought that Stonehenge actually was an ancient timepiece, capturing the light of dawn on the spring and fall equinoxes. Many people relied on make shift sun dials. Early on sand clocks and water clocks were made to measure time. 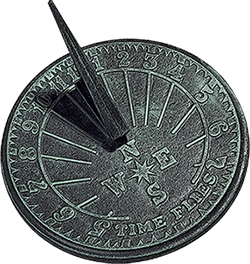 Research ancient timepieces to see how people in the past measured and kept track of time. Make sketches of the at least three different time pieces and three different systems of time. Keep track of your time! How do we think of time? We may remember moments in time. We may catch ourselves thinking in a reflective time. We may pass time. We could feel happy, sad or angry in an emotional time. Sometimes, we feel as if we have too little time or that we have actually lost track of time or even lost time! Make a poster about all the types of time that you can think of. Use wordle to experiment. Make a font poster of the word time that expresses different qualities suggested above. Have some fun with time! Now that you have spent some time thinking about time, telling time and plotting time around the world, let’s talk about putting time in perspective. For instance, how long have humans been around? If we use a 24 hour day as a clock, and the earth formed at midnight, humans have been around since 11:59 pm or a mere one second before the next midnight. What if we measure human existence on a clock of 60 seconds? When would people arrive on the scene? Who came before us? How long did it take? Watch the Evolution of Life in Sixty Seconds and make a sixty-second clock that shows when humans arrived on the scene. 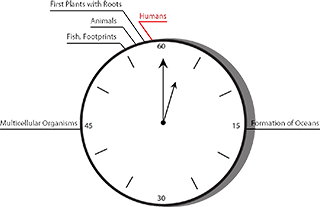 Below your graphic clock, make a timeline of the periods of activity and nonactivity that preceded us. Which is better? Something old or something new? While it can be exciting to get something new, it is also always very rewarding to have things that are old. If newness were the most important value, we would constantly be throwing things away to replace them with something newer. Picking up an old rock or old coin is like holding history in your hand. 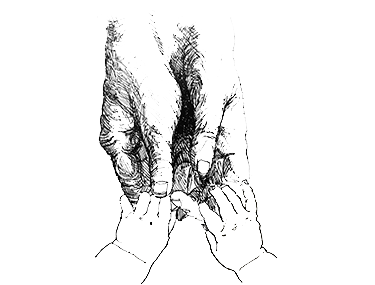 Talking to a grandparent or someone who has been fortunate to live a long life opens doors into the past. Look around your life. Who is the oldest living person you know? Go ask them what it was like growing up. Ask them what their favorite past times were. Ask them to tell you about something that they have that is important to them that is as old as their youth. If they are willing, take their picture and write a report on your talk. One way to understand time is to learn how long things exist in the world. How long does a fly last? How long does the line in the middle of the road stay white? How long does a dollar bill last? How long does an oak tree last? What is the average life expectancy of a woman in the United States? What is the life expectancy of a man in Sweden? How long with the pyramids last? How long will my bike last? Look up the book, Life Spans, Or How Things Last by Frank Kendig and Richard Hutton. Find the life span of ten different living and non-living objects. Make two bar charts comparing life expectancy of things in the world! Make a bar chart comparing life expectancy of humans around the world. What things do you think will last the longest time? Which things do you wish could last longer? TEDed How Does Our Body Tell Time?